DETROIT—Online registration is almost over for Tour de Troit, an annual event that has become something of a local holiday for cyclists from Michigan and beyond. Friday, Sept. 13, will be the last day people can sign up through Eventbrite to participate in this year's ride, although there will be an opportunity to register on site at the actual event on Saturday, Sept. 21. For those who haven't heard, Tour de Troit is a leisurely bike tour that draws thousands of people to Detroit each fall. The approximately 30-mile ride starts and finishes by the old train station in Corktown's Roosevelt Park. It's designed to be friendly to riders of all ages and skill levels. Children are welcome, provided they come with a parent or guardian. Admission ranges between $40 and $65, depending on when people register. Those attending are advised to bring a spare bike tube with them and to take their bicycles on a test run prior to the ride. A longer 62-mile ride called the Metric Century is also available for more experienced riders. This year's main route will stick to the city's major streets, taking participants through Southwest Detroit, the riverfront, downtown, Belle Isle, West Village, Midtown, Woodbridge, and other neighborhoods. The Detroit Police will be closing off streets that Saturday to accommodate the cycle traffic and ensure the safety of those riding. "Basically it's a celebration of bicycling," says Bil Lusa, Chairman of the Board for the Tour de Troit nonprofit. "You get to cruise through the streets, talk to your friends and fellow cyclists [and] ride back to the park. The after party includes food from local restaurants and beer from local breweries." Tour de Troit has grown steadily since riders first started pedaling the event in 2002. In fact, The League of Michigan Bicyclists now lists it as the state's biggest annual ride. In 2012, it attracted 5,000 cyclists, and organizers expect it to break 6,000 this year. Where do these riders come from? All over the planet, according to Lusa. "Every year we definitely have a handful that come from Europe that make it part of their trip. We've had riders from Scotland and Germany and Brazil," said Lusa. "Additionally, cycling events in Detroit have always been really popular with Canadians, who are just across the way. You see a lot of people coming in from Ontario. Not just in the Windsor area, but all the way out to Toronto." Within the United States, they'll be arriving from more than twenty states coasts to coast. Ann Arbor and Royal Oak are two of the regional hotspots for participants. Those who ride Detroit Critical Mass, Slow Roll and other regular Detroit rides are also bound to find some familiar faces. Kelli Kavanaugh, one of Tour de Troit's co-directors (and a co-owner of the Wheelhouse Detroit Bike Shop), expects a lot of Detroit participants this year and says many of them will be helping out. "The guys from Slow Roll are volunteers for Tour de Troit. The Hub and Back Alley Bikes are volunteering," she said. "It is the biggest cycling event in the city, so everyone in Detroit who cares about cycling, they're all involved in this." The event's big expected turnout is going to have a big payoff for local riders as well. This year marks the organization's first year as an official 501c3 nonprofit. 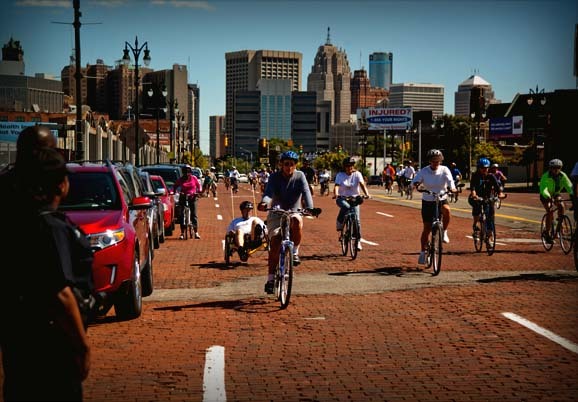 The new tax-exempt status should make it even easier for the organization to carry on its mission of supporting greenways and cycling infrastructure in Detroit through Tour de Troit and other events. So far, the ride has raised nearly $160,000 for this cause. 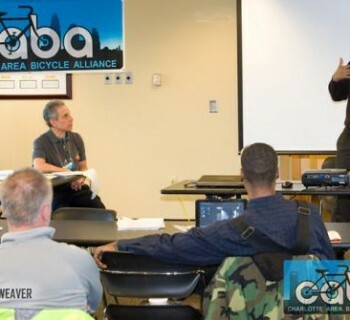 At first, the group's efforts went towards the Southwest Detroit Greenlink. 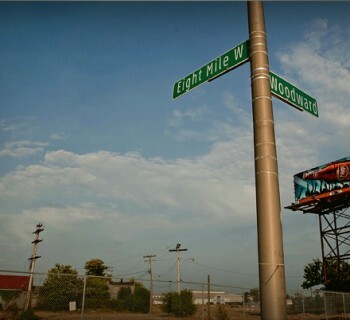 Between 2005 and 2010, the organization put $120,000 towards the development of more than 17 miles of bike lanes along that route, which links Corktown, Mexicantown and Southwest Detroit. Over the last few years, the Tour de Troit organization has also brought in $3,000 for non-motorized routes in Hamtramck with a Paczki Run event, $2,500 for the Conner Creek Greenway with a ride called Cycle Into Spring and $7,500 for the GREEN Taskforce's East Side Detroit greenways initiative, which is being spearheaded by The Villages Community Development Corporation. Money raised at this year's Tour de Troit will go towards creating a city-wide system of wayfinders, which will help guide cyclists as they navigate Detroit's greenways. It's an effort the organization has already raised $20,000 for and should start implementing next year. "A wayfinding system can include mapping, routing, branding and visuals. It could also include bike parking or racks in places that need them," Kavanaugh told Mode Shift. "It's pretty open right now," she said, adding that the specifics of the project will be decided by the community of groups involved with the city's greenway network. While acknowledging this worthy cause, Lusa, Tour de Troit chairman, also urges prospective riders to consider some more practical reasons for participating in the day's festivities. 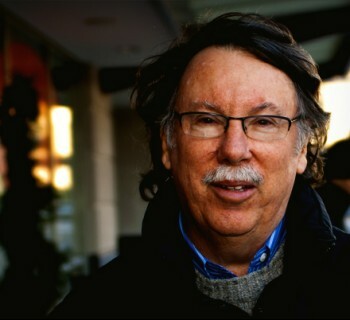 "We shouldn't lose sight of the fact that it's a really good time," he said. "It's a lot of fun. Everyone who comes and rides with us seems to come back and bring a couple of friends."